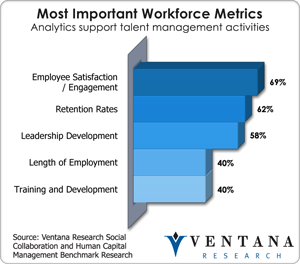 The use of social collaboration to support human capital management is increasing as the need to engage talent becomes a higher priority in organizations. In particular, those that have a growing population of workers from the millennial generation see social media as a primary means of communication. 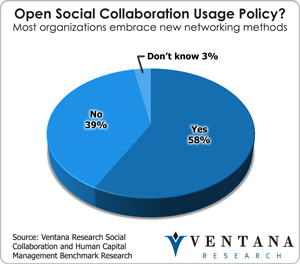 Social collaboration is growing in acceptance – 58 percent of organizations now permit it, according to our benchmark research on social collaboration and human capital management (HCM). For many organizations, this opens up communication with employees that goes well beyond electronic mail. It’s clear that sales organizations need to be efficient, but many are unaware of critical applications they could deploy to establish sales excellence. In my recent analysis, “Sales Organizations Need a Swift Technology Kick”, I outlined why sales departments have to look beyond using sales force automation (SFA) and spreadsheets andexamine dedicated applications for improving productivity and effectiveness. 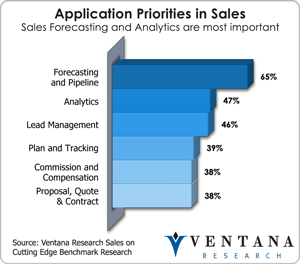 Our benchmark research in sales applications found a new set of application priorities in sales organizations that you should assess to determine how well your sales efforts match up to others’. Also, in most cases, we found the prioritization and needs of sales organizations are not aligned, resulting in wasted time and likely creating a lack of access to accurate information for sales management and operations. Pitney Bowes (PB) opened its annual technology summit (Twitter: #TechSummit12) with a review of its organizational assets and its rich history of engineering hardware and systems for physical and now digital delivery of communications. The multibillion-dollar technology giant is transforming itself to address the digital needs of business for interaction with consumers. 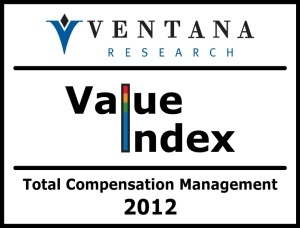 It also is working to transform how business communications and interactions work across all channels. Handling new media interactions using Facebook, Twitter, e-commerce and mobile technologies are critical to managing communications in a consistent manner and improving the customer experience. Business has been getting smarter about using technology for analyzing processes and optimizing outcomes, but still has much room for improvement when it comes to operational management. Traditional project management has advanced to encompass financial and operational planning, including prioritization toward goals and expected outcomes, creating the concept of portfolio management. In essence, optimizing the use of people and processes associated with products and services along with supporting technology is what portfolio management is all about. Unfortunately, many organizations that use personal productivity tools do not realize that email, presentations and spreadsheets are not efficient or effective tools for these purposes compared to adopting applications designed for them. 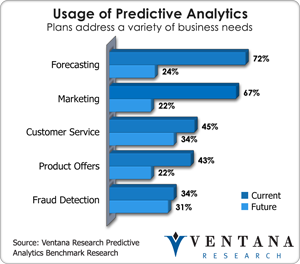 In our benchmark research in predictive analytics we’ve uncovered some intriguing tools for taking advantage of big data in the enterprise. Revolution Analytics, which we analyzed earlier this year, this month introduced its 6.0 release. Revolution extends the open source statistical programming language R with capabilities you would expect out of enterprise software. The company has grown substantially over the last several years and has an impressive list of more than a hundred customers in both the private and public sectors. 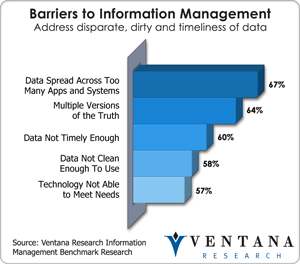 Revolution partners with database and data integration providers such as Talend and Informatica and business intelligence providers who want to connect to more advanced level of analytics. Revolution can operate across a range of big data architectures, including Hadoop, working with Cloudera and IBM as well as data warehouse appliances such as IBM Netezza and Teradata. 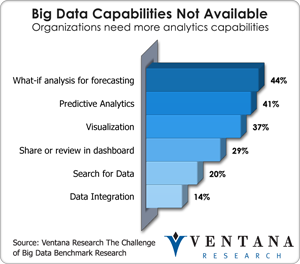 This is a smart move, since predictive analytics is the second most important unavailable capability cited by big data deployments in to our benchmark research. Using Hadoop just got easier, thanks to Teradata’s introduction of SQL-H, a new query interface to analyze data from Hadoop. Most Hadoop access methods require preprocessing and staging of data from the Hadoop Distributed File System (HDFS) using technologies such as MapReduce. 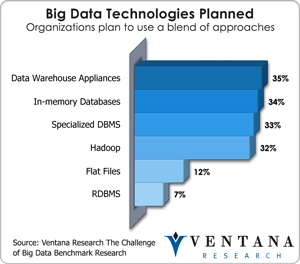 These approaches require new skills and technologies, introducing more time and costs for users, which offset the benefits of Hadoop, which according to our big data benchmark research include increasing the speed of analysis. Teradata has announced support for SQL-H not only for its own Aster Database 5.0, which it expects to release in the third quarter, but also supporting the commercial version of Hadoop through Hortonworks. At first I thought 1010data just developed a faster data warehouse technology to be used with business intelligence tools. After a recent briefing, however, I learned that it provides much more than a data warehouse; the product is a large-scale analytics server that empowers business analysts to work on big data, conducting for, example, market basket analysis or correlations of customer and product information. 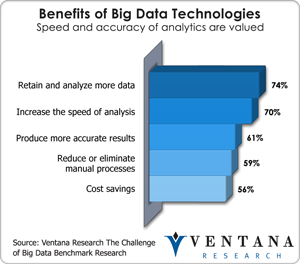 The software lets organizations retain and analyze more data and increase the speed of analysis, which our benchmark research on big data found to be the top two benefits of the technology for more than 70 percent of organizations. More than 1,000 people attended the 32nd annual Information Builders Summit conference this week to learn about the company’s advances in big data, business analytics, cloud computing, mobile technology and social media, which CEO and founder Gerald Cohen announced and demonstrated during his keynote address. With WebFOCUS version 8, Information Builders has made significant strides in a range of technology areas to support analytics and visualization since my analysis after last year’s conference.